Tractor-Drawn Aerials (TDAs) once were a common sight in fire department fleets, especially in fire departments where their coverage area includes older city areas filled with narrow streets, or tightly-spaced apartment buildings. But TDAs fell out of favor for a number of years, surpassed in their numbers by rear-mount and mid-mount aerial ladders and platforms. However, TDA use has seen a resurgence in recent years, likely due to the rig’s maneuverability, its ability to carry a lot of ground ladders, and the tiller’s expansive compartmentation. Maneuverability of a tractor-drawn aerial is cited by most adherents as its most desirable quality with the TDA being able to navigate tight city streets and the traffic that tends to clog them. Being able to easily position a TDA in front of a building is noted by many users as another benefit of using the articulated rig instead of a mid-mount or rear-mount aerial. Pete Hoherchak, product manager of aerials for KME, notes that a TDA tractor without a pump or water tank has a short wheelbase of 141 inches. “The rule of thumb with a TDA is wherever the tractor can go, the trailer can follow,” Hoherchak says. And when setting up in tight spaces, the width of the jack spread is important, he adds. “For setup, KME has the shortest outrigger stance, which is a 14-foot jack spread on all our TDAs,” he says. 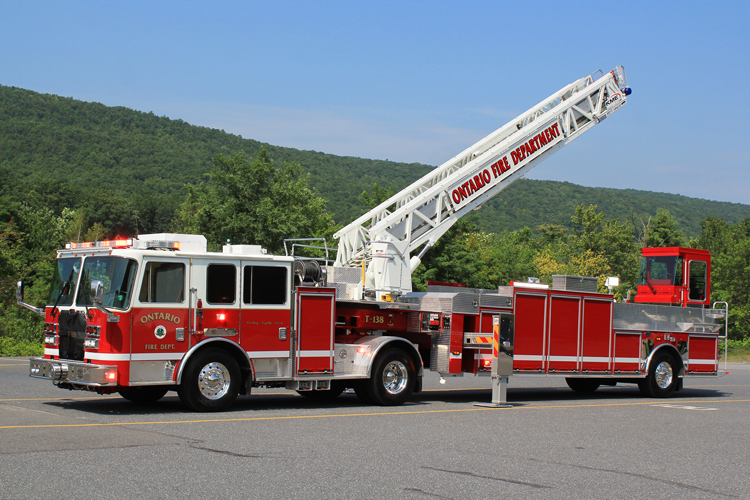 Because a TDA’s ladder turntable is in the middle of the truck, the vehicle can be jack-knifed to position it, which gives the TDA a reach advantage over a similarly-sized rear-mount aerial ladder because the TDA’s turntable would be closer to the building. And by jack-knifing a TDA, an operator can get to a lower elevation, which gives a greater reach at low angles. The capability to carry a large complement of ground ladders, compared to other aerial ladders and platforms is another advantage to using a TDA. Hoherchak notes that KME can get in excess of 220 feet of ground ladders on its TDAs. “If you are not able to get the truck positioned to reach the fire building, having enough ground ladders to hit the windows of the building is an important benefit,” he observes. The length of the trailer on a TDA allows a department to carry two-section 35-foot or two-section 40-foot extension ladders, along with 20-foot straight ladders. Hoherchak points out the tiller cab needs to be well designed to allow for maximum visibility by the tillerman. KME has eliminated the A posts in the corner of the tiller cab by using bonded glass so the tillerman has a better view to the front and side of the tiller cab to observe street markers, pavement lines, and parked cars.